LED’s are as close as we can get to a perfect point light source, so it seems odd to compromise this almost perfect geometry by assembling large area arrays. Large area arrays result in overlapping illumination from multiple LED’s, and this causes undercutting of image detail when exposing screens. Take as example a halftone dot. It has only one job to perform during the screen exposure process. It must cast a nice sharp shadow. When this happens the underlying emulsion gets protected from being exposed. A halftone dot can only do this when illuminated sharply from one direction. If fluorescent tubes, or LED array, are used for exposure, then multiple faint shadows are cast on the emulsion and it becomes partially exposed. The analogy is standing in a field lit by multiple floodlights. Look around and count the shadows, none of them as sharp and distinct as a shadow cast by direct sunlight (from another almost perfect point light source). This comparison is illustrated with the following GIFs. Another benefit of choosing LED exposure is the ability to optimize the spectrum of light output. 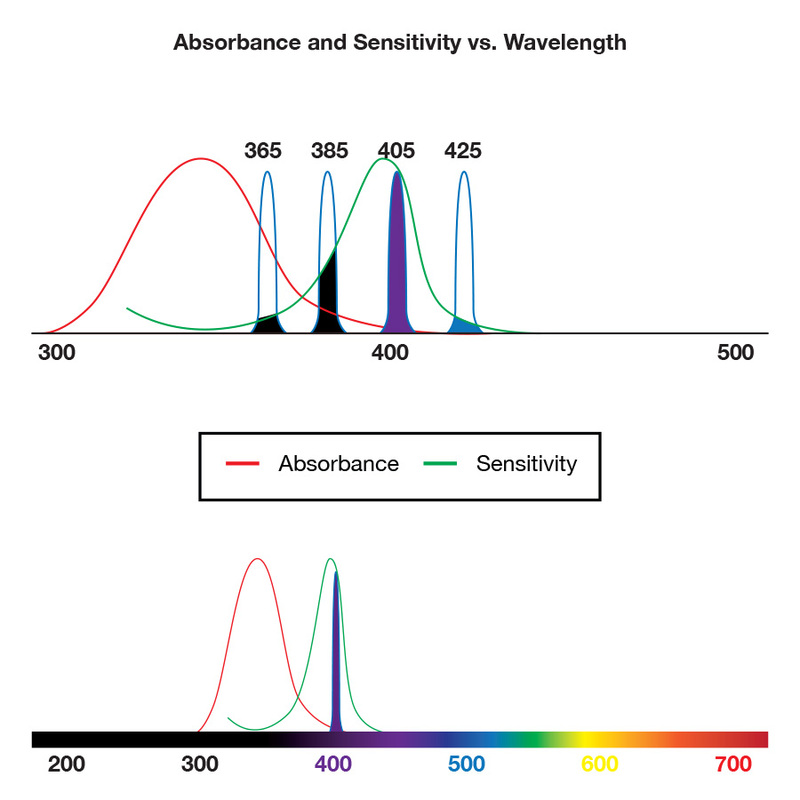 Exposure time & correct curing of emulsion are both heavily dependent on using light of the correct wavelengths. This light must be able to both penetrate the coating, as well as promote cross-linking. Many different choices of LED are available, with some designed to emit light in a narrow band of wavelength. Examples shown below include UV wavelengths, at 365nm & 385nm, as well as violet & blue actinic light wavelengths at 405nm & 425nm. 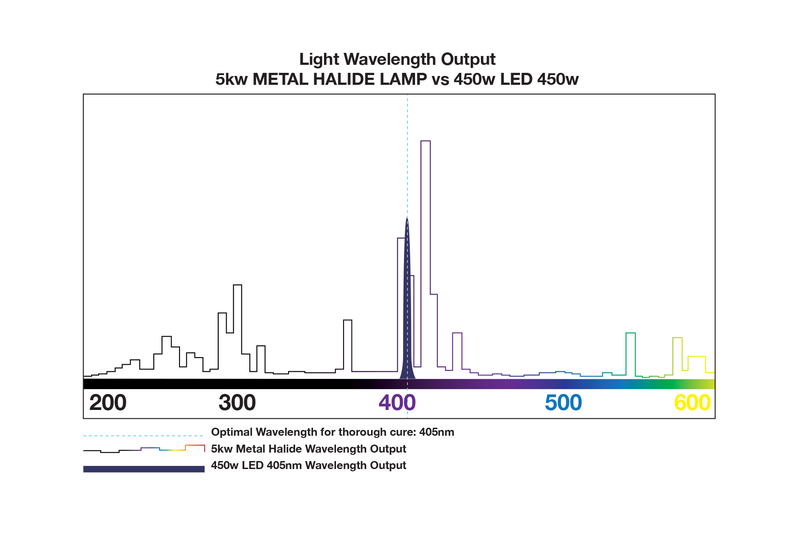 The 405 nm LED output is illustrated alongside metal halide lamp output for comparison, since this used to represent the ‘gold standard’ of exposure lamps. The ability of light to penetrate and crosslink the emulsion is directly related to its wavelength, and also how the light is able to react with the diazo, or photopolymer, that is used to ‘sensitize’ the emulsion. UV light is too strongly absorbed to penetrate thicker coatings. In this case, we require longer wavelength violet/blue light, that is better able to penetrate and crosslink the emulsion. Using 405nm light we can cure the emulsion surface, as well as deeper layers, to effectively crosslink the emulsion that is in contact with the mesh. This way we encapsulate the mesh threads after wash out, in order to guarantee robust screens that are able to withstand the rigors of printing and cleaning on press. Using 405nm LED we also get the benefit of wider exposure latitude, because during exposure we are curing the front, middle & back of the coating simultaneously, as result of the deeper light penetration. The GIFs below show a comparison of partial cure with UV, versus full cure with 405nm, and illustrate how violet/blue wavelengths are more effective at curing stencils than UV.